Just one month before Apple Pay is rumored to launch in Canada, large bank TD Canada Trust briefly provided evidence of the forthcoming launch by prematurely listing the iPhone-based mobile payments service as a method of payment on its website, as spotted by blog iPhone in Canada. The link has since been removed. 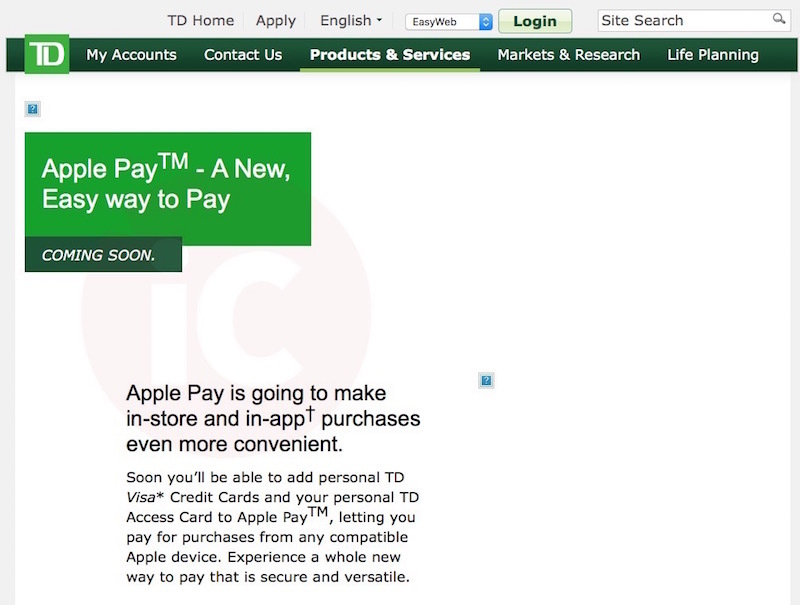 Apple Pay was briefly listed under "Ways to Pay" at the bottom of TD Canada Trust's website, but the link now leads to a blank page. When it was live, the page said that Apple Pay will soon support TD Canada Trust debit and credit cards, with purchases subject to a $100 transaction limit like other contactless payments in Canada. In April, The Wall Street Journal reported that Apple was in negotiations with the Royal Bank of Canada, TD Canada Trust, Scotiabank, Bank of Montreal, CIBC and National Bank of Canada about a potential November launch of Apple Pay in Canada. The six financial institutions combined account for more than 90% of Canadian bank accounts. Apple Pay launched in the United States last October, and expanded to the United Kingdom in July. TD Canada Trust has around 11 million customers in Canada. "US and UK, thank you for the beta testing"
But seriously: About "seven-stars" time! I wonder if the Visa-only limitation is only for TD, or if it'll be for all Canadian banks on launch. A lot of people only have MasterCards, so that could be troublesome. This is for RBC US. Not Canada. So Cook's interview has come and gone, and not a word on Apple Pay... Oh well. Looks like we have to wait a bit longer. Found this while looking for Apple Pay in Canada. This is great news! As solid a confirm as one can get without an official announcement. I am just surprised they are keeping it so quiet. Apple Pay in UK was announced about a month in advance I think. Hello, I am not a TD client, however, I have recently applied for Apple Financial Services, which I have noticed is handled by TD. To obtain information about your account with Apple financed by TD Financing Services, please contact TD Financing Services at 1-866-508-6312. So on TD's mobile payment site there is only their system for payments and mentioning of compatible devices .. which only are Blackberry and Android phones. Yet at the bottom there is mention of Apple and Apple store as trademarks of Apple, yet no where else in the video or for the mobile payment references is there mentioning of Apple being compatible nor Apple at all. This is being done. There is no monolithic $100 transaction limit. What does exist is a merchant limit with their own credit card processor. This limit varies by merchant. The IGA I went to had a $100 limit on tap. A local boucherie in the same shopping mall had no limit whatsoever - I charged $300 there via ApplePay. On the US side of the border there are even fewer limits on ApplePay. I charged $500.00 at the Apple Store and $5,500.00 for a car down payment using ApplePay. There are two different things involved here. Newer NFC payment terminals can be set up so that there is no (or very high) transaction limit on Apple Pay purchases because the transaction is authenticated via touch id on the phone. But this requires the terminal to be set up so that it recognizes that you are paying with Apple Pay and not some random contactless credit card. I am quite sure that your car down payment and your Apple Store payments were done via one of those. But older NFC terminals (or newer ones not specifically configured for Apple Pay) will still work with Apple Pay but will treat it as a regular contactless cedit card. All those have fairly low transaction limits (usually no more than 100$) to mitigate against fraud because paying with a contactless credit card does not involve any authentication.